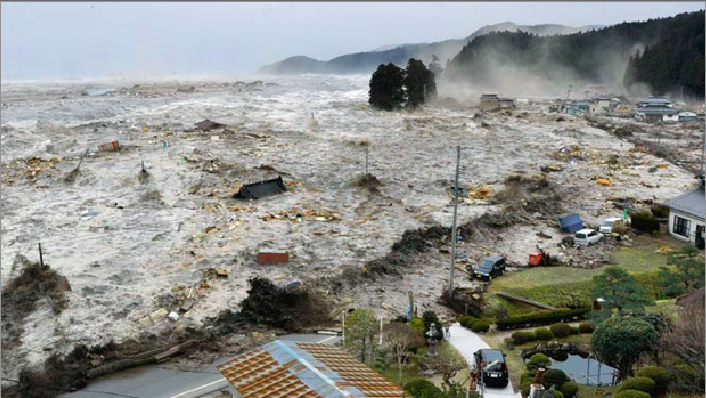 The 2011 Tohoku tsunami led to extreme run-up heights along a wide stretch of Japan’s eastern coastline. Amateur videographers captured sea-level rises in excess of 50ft, including this footage from a cove a mile east of downtown Miyako City. □ On March 11, 2011, a mega-thrust earthquake 50 miles east of Japan created a series of catastrophic tsunami waves which obliterated a 260-mile stretch of the Tohoku coastline. The scale of the disaster was unprecedented in the developed world, both in raw devastation and monetary loss. An estimated 19,334 people were killed in Japan, with the majority of the deaths occurring in the Miyagi and Iwate Prefectures (Suppasri, Koshimura, Imai, Mas et al., 2012). The financial toll of the entire event is estimated to be approximately $235 billion, more than double the world record set by the 1995 Kobe earthquake. Detailed satellite view of six communities discussed in this article with labels and wave heights next to each city (large file size). The event was documented by an unprecedented number of videographers, providing researchers a firsthand glimpse at the power of a large tsunami. Prior to the 2011 disaster, the largest tsunami ever clearly documented on film was a 33ft wall of water that obliterated the resort town of Khao Lak, Thailand, in 2004. Multiple videographers captured sea-level rises in excess of 50ft during the Tohoku tsunami – and a Japanese record run-up height of 133ft was surveyed eight miles southeast of central Miyako City. Below is a list of several population centers affected by the tsunami. Included is imagery of the tsunami, information regarding the survey results in each area and updated fatality statistics. As with all tsunamis, the height and characteristics of the waves varied tremendously along the worst affected coastline. An explanation of the terms inundation height, flow-depth and run-up can be found at the bottom of the article. The tsunami developed into a 20ft vertical bore as it swept inland at Kuji. The run-up along the bayfront was consistently 27ft, with greater heights attained in a small harbor just south of the main industrial section of the city. Kuji was the northernmost city in the Tohoku region to be severely affected by the 2011 tsunami. Due to the bathymetry of the coastline, the tsunami in Kuji Bay developed into a series of bores (steep waves) with vertical heights of approximately 20ft. Multiple videographers captured the tsunami waves over-topping the city’s breakwalls and inundating an industrial area. The tsunami traveled a half mile inland, leaving watermarks 7ft above street-level in a commercial district. A total of 1.5 square miles of bayfront land was submerged in the icy waters, resulting in over $200 million in damage. A survey team later determined that the inundation depth along the bayfront was 28ft with little variation from north to south. The maximum run-up height of 44ft was found in a small harbor just south of the main port, where several amateur videos were taken (“Executive Summary…“, 2011). Despite the severity of the damage in Kuji Bay, only four fatalities were documented in the city (“IOC/UNESCO…”, 2011). The bodies of two of the victims were never recovered. Just south of Kuji lies the community of Noda, which was also impacted by a series of large bores. The tsunami attained greater run-up heights in Noda, up to 57ft in the town’s port, leading to the deaths of 38 residents (NOAA, 2012). The tsunami entered Miyako Bay from the northeast and rapidly overtopped floodwalls along the Hei River. Rough examination of this footage indicates a sea-level rise of approximately 25ft. The greatest run-up heights in the area were found at a pier a mile southwest of the city center. Miyako City is built on the banks of a large, funnel-shaped bay which opens to the northeast, perpendicular to the tsunami source. The 2011 tsunami reached its greatest heights in small coves several miles south of the bay entrance. Fortunately, the shape and position of the bay reduced the run-up heights along Miyako City’s shorefront. The fast-moving waters, however, were still significantly higher than the sea-walls built to protect coastal neighborhoods. Amateur footage reveals that the tsunami swept up the Hei River at speeds in excess of 20mph. In the Shirahama district, the tsunami overtopped a 25ft sea-wall by 13ft, leading to the complete destruction of adjacent buildings (“IOC/UNESCO…”, 2011). Thousands of one and two-story wood structures were swept away in the tsunami, killing many who were unable to evacuate in time. The city’s seawalls trapped water within populated areas, delaying rescue efforts by several hours. 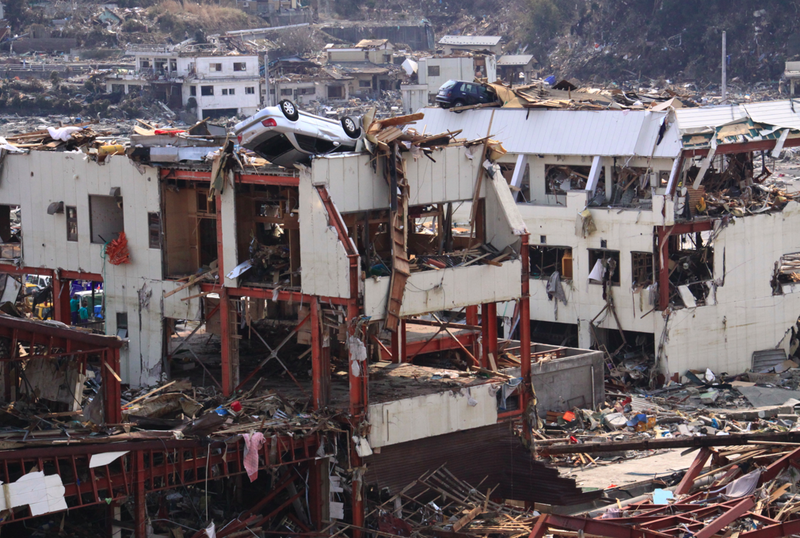 More than 400 fatalities were recorded in Miyako City and a similar number were lost in small towns and ports just outside the city limits. The community of Tarou, just north of Miyako City, was obliterated by the first tsunami wave despite being surrounded by a massive 34ft defense barrier. A survey team found that Taro’s seawall was overtopped by more than 25ft, and run-up heights over 80ft were found in hills above the town (ASCE, 2013). The greatest tsunami heights documented anywhere in Japan occurred on the Pacific side of the Omoe Penninula, just southeast of Miyako City. The greatest run-up height ever recorded as a result of a seismic event occurred in the inlet of Aneyoshi, located on Omoe Penninsiula. The funnel shaped bay amplified the in-rushing tsunami wave, leading to a run-up height of 133ft. (Okayasu, Shimozono, Sato et al, 2012). A cameraman above a small village on the Omoe Penninsula captured a sea-level rise in excess of 65ft. The tsunami completely engulfed the town in less than 10 seconds. 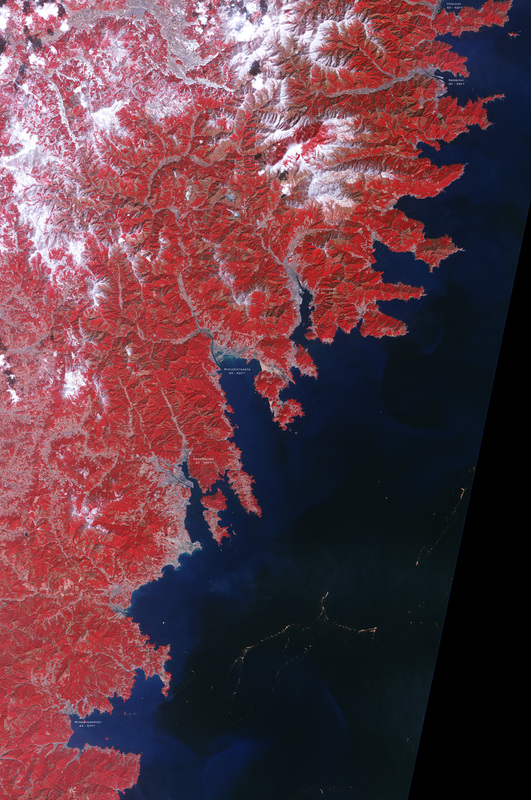 Ōtsuchi, population 16,000, experienced significantly greater run-up heights than adjacent cities due, in part, to the area’s underwater bathymetry. Akihiro Sato captured the destruction of the city from a nearby hillside. 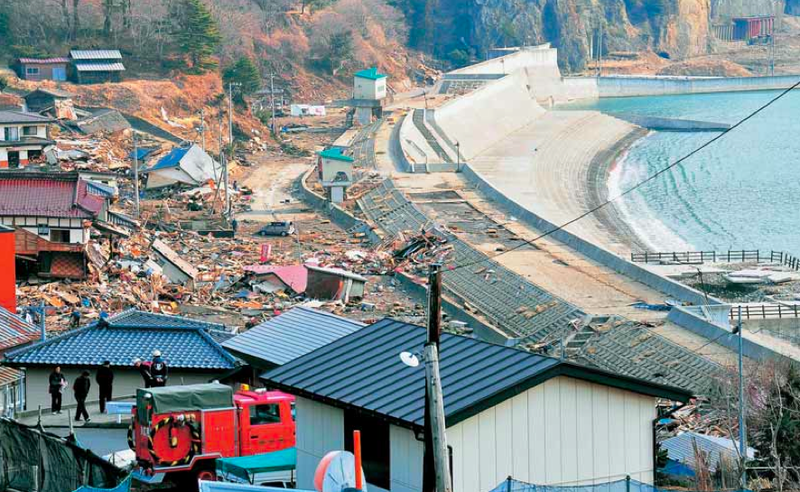 Otsuchi, a small fishing community in central Iwate Prefecture, suffered catastrophic damage from the tsunami. The city’s elaborate tsunami defense barrier, complete with 12 gates, was overwhelmed by the tsunami less than 25 minutes after the earthquake. One video captured by a local resident revealed that the tsunami crest was preceded by a swiftly rising tide which inundated the city’s port facilities. More than two dozen local firemen were working to seal shut the seawall gates when a massive bulge of water rounded the bay entrance and surged towards the city center. The large wave swept high over the city’s concrete floodwall, killing at least 12 firemen (Chock et al., 2013). Cars sped down Otsuchi’s narrow streets as the wall of water roared through the city, ripping entire neighborhoods from their foundations. Horrified spectators watched from nearby hillsides as the tsunami enveloped more than half the town, leaving only a sea of floating debris in its wake. Otsuchi experienced some of the greatest run-up heights of any city in Iwate Prefecture. A survey team found run-up heights of 49 to 62ft along the bayfront, levels that were equal to or higher than the watermarks measured at the mouth of Otsuchi Bay (Mori et al., 2012). The city lost 12.1% of its population in the disaster, one of the highest fatality rates of any community affected by the tsunami. Otsuchi’s mayor, Koki Kato, was among the dead (“The Japan Tokoku…”, 2011). Only a few dozen reinforced buildings remained standing in Otsuchi’s downtown area, and most were were later demolished due to irreparable structural damage. While flow-depths of 10ft are capable of leveling many wood-framed structures, it often requires flow-depths in excess of 20ft to sweep away well-built, multi-story structures. Otsuchi was one of several cities which showed evidence of extreme surge heights in excess of 50ft. Kamaishi is a small industrial city located on steep mountain slopes 20 miles south of Miyako Bay. In 2009, the city finished construction of one of the world’s largest tsunami barriers at a cost of over $1 billion. The breakwall was over a mile long and a world record 69 yards in width (Onishi, 2011). Following the 2011 earthquake, a 72ft tsunami wave crashed ashore at the entrance to Kamaishi Bay, two miles from the center of the city (Mori, Takahashi et al., 2011). The surge over-topped the massive two-armed breakwall and inundated the placid waters of the bay. Amateur footage revealed that the harbor waters remained calm and glassy while the sea-level rapidly rose to the third floor of oceanfront buildings. Many of the victims were killed in vehicles trying to flee the area, and one man captured the wave engulfing residents running for higher ground. A total of 2.7 square miles of land was inundated within the city. A survey team concluded that the tsunami reached heights of 33ft above sea-level in populated sections of Kamaishi harbor (Mori, Takahashi, 2012). While the tsunami barrier failed to avert the disaster, the massive seawall was likely a factor in the diminished run-up heights within the city. A total of 1,082 people in Kamaishi were reported as either dead or missing in a final morbidity report (“The Japan Tohoku…”, 2011). Severe damage to bayfront buildings in Kamaishi. A videographer in this area captured the entire tsunami sequence, which revealed that the first wave caused nearly all of the destruction. The tsunami did not develop into a bore in Ofunato harbor and instead arrived as a rapidly rising tide, as seen in this footage by a local TV reporter. 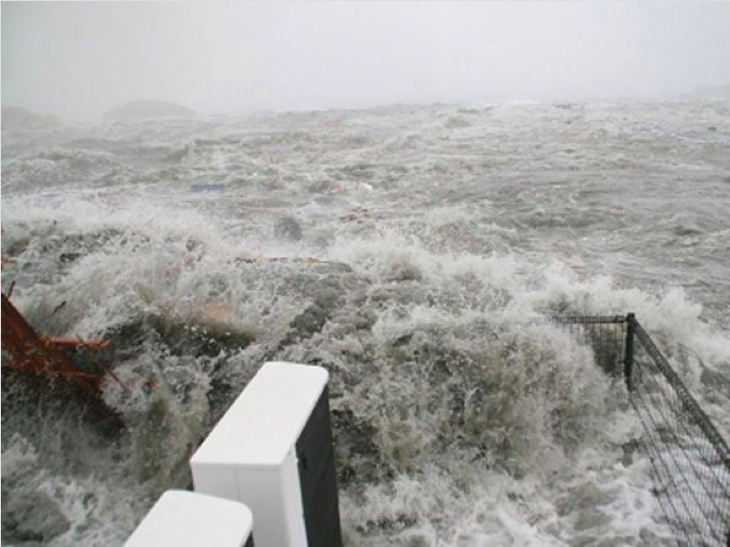 The city experienced the lowest run-up heights of any major harbor along the worst affected section of the Tohoku coastline. 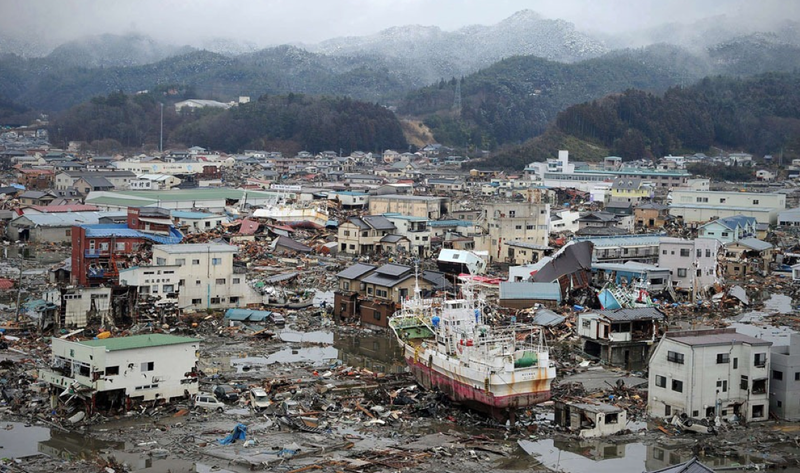 The small city of Ofunato, with a population of approximately 47,000, suffered severe damage in the 2011 tsunami. Like many port communities in the area, the city is located at the end of a long, winding ria with a narrow entrance to the Pacific Ocean. Amateur footage from the city indicates that the tsunami commenced as a deceptively subtle sea level rise along the bayfront. As the tsunami funneled through the narrow waterway towards the city, Ofunato Bay turned into a raging river of mud and debris. The water reversed the Sakari River and sent torrents of water upstream, spilling over floodwalls and enveloping city streets. Residents in the bottom floors of buildings near the port were overcome as the freezing waters rose above second floor ceilings. The inundation height of the tsunami averaged approximately 28ft in Ofunato, half the value surveyed in many adjacent areas (“Tsunami Event”, 2012). The shorefront property in the city was destroyed, with many wood-framed structures swept completely away. Apartment complexes nearly two miles up the Sakari River were severely damaged by the surge, and tracts of commercial buildings on the western shore of Ofunato Bay were left as bare concrete slabs. The city’s large industrial area likely buffered residential areas farther inland, reducing the death toll to under 500. 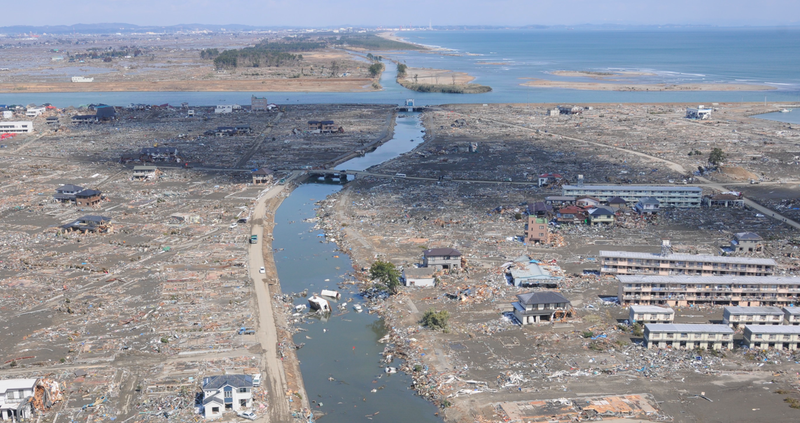 Few photographs exist of the tsunami in Rikuzentakata due to the low survival rate in the inundation zone. One image captured the first wave sweeping across a residential area a mile from the bayfront (the surge can be seen pouring out of the Kesan River at upper left). A local police official filmed the tsunami sequence in Rikuzentakata and adjacent Ofunato from a helicopter. Rikuzentakata is located in a large, hammerhead-shaped bay near the southern border of Iwate Prefecture. 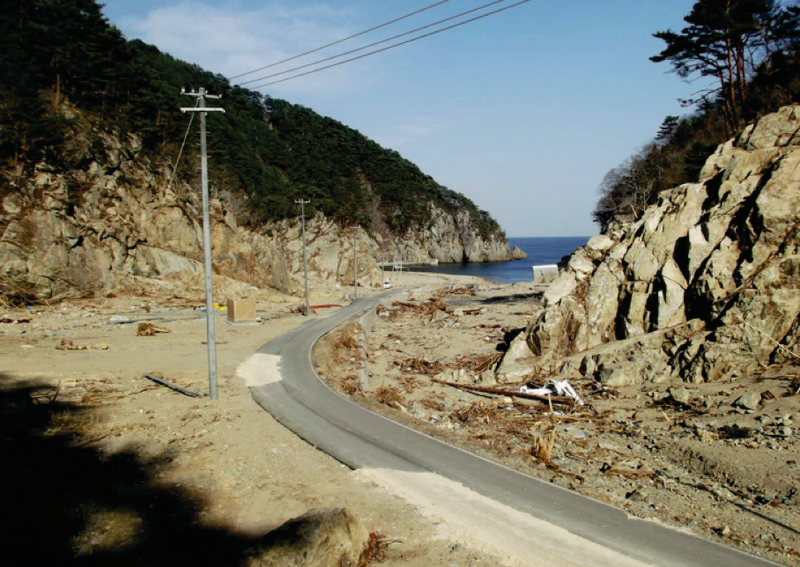 The city, like most along the jagged Tohoku coastline, is notoriously vulnerable to tsunamis. Several damaging events have impacted the area in the past 100 years, the most severe being the 1960 Pacific Ocean tsunami, which originated 10,000 miles away in Chile. In order to combat the threat of tsunamis, the city built an elaborate harbor barrier and planted a forest of 70,000 pine trees as a shoreline buffer. As the 2011 tsunami entered the bay, dozens of firemen worked to close several large gates meant to protect the city. Video footage taken by a surviving fireman revealed that the first wave began as a gentle sea-level rise, prompting many spectators to remain near the bayfront. A similar arrival sequence also occurred at other locations, leading researchers to postulate that the earthquake generated a smaller tsunami which arrived several minutes before the primary wave. As the sea continued to rise, a much larger surge of water swept over the breakwall and roared inland as a huge wall of mud and debris. The primary wave overwhelmed the city’s tsunami gates, killing 49 firemen and removing all but a single pine tree in the barrier forest (“The Japan Tohoku…”, 2011). The leading edge of the first wave roared inland at great speeds, engulfing large sections of the city built on a flat river delta. More than half of the city’s 68 evacuation shelters were overwhelmed by the tsunami, killing many residents who took appropriate safety measures (Chock, Kriebel, Francis et al., 2011). Massive volumes of seawater were channeled more than six miles up the Kesen River, reducing inland villages to bare foundations. 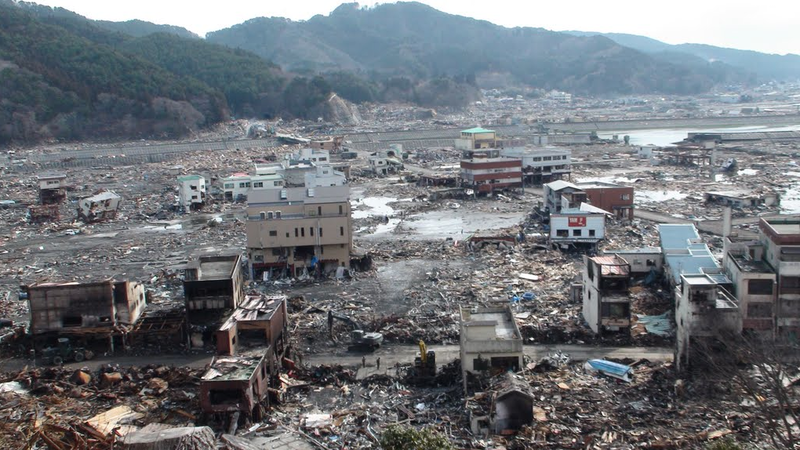 Rikuzentakata experienced the most catastrophic damage of any city affected by the tsunami. Inundation heights over 55ft were surveyed throughout the city, and a run-up height of 70ft was found inland and just east of the bay center (Liu et al., 2012). Flow-depths between 43ft and 50ft were surveyed in the primary residential area of Rikuzentakata (Yeh, Sato, Tajima, 2012). Demographic data revealed that just under 10% of Rikuzentakata’s residents were killed, one of the highest fatality rates of any community affected by the tsunami (Liu et al., 2012). One of the most concerning aspects of the disaster was the high number of fatalities in designated evacuation shelters. The well-built Rikuzentakata Community Center and Gym, packed with evacuees, was completely submerged in the raging torrent. Rescuers later found the building intact but void of any signs of life – all but two of the people sheltering inside were swept away and drowned (Chock et al., 2011). Nearby, the triangle-shaped Rikuzentakata Station, also a designated shelter, was engulfed by flow-depths in excess of 40ft – killing all of the residents sheltering inside (Liu et al., 2012). 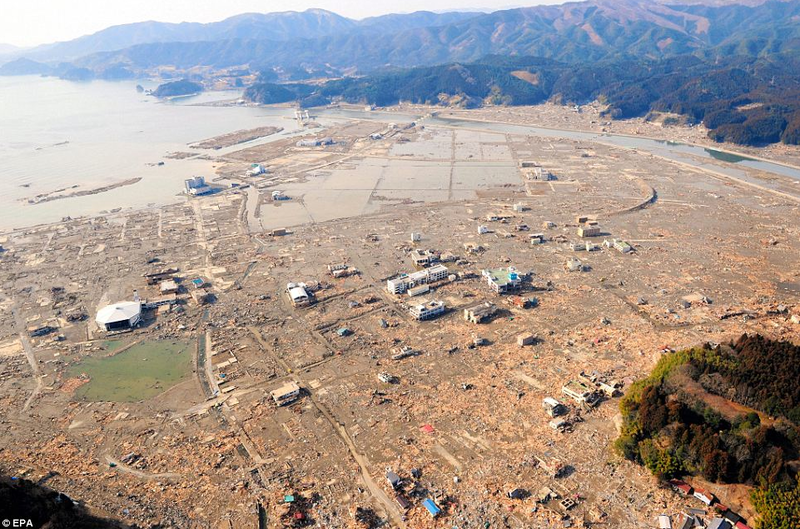 Rikuzentakata was the largest city to be directly affected by waves in excess of 60ft. Flow-depths greater than 45ft were found half a mile inland as the tsunami travelled up river valleys lined with densely populated residential neighborhoods. The city suffered the second greatest death toll of any population center affected by the tsunami. At left, only one tree remained in Rikuzentakata’s tsunami defense forest following the disaster. Rikuzentakata Station is visible as the triangle shaped structure in the distance. At right, the surge reached the fifth floor of an apartment complex 400 yards from the shoreline. A cameraman captured the tsunami sweeping through a bay-front district in the Kesennuma narrows. Inundation depths were approximately 34ft in this area, while watermarks up to 39ft were found near the bay terminus. Kesennuma is a port community located at the end of a long, narrow ria (fjord like bay) in northern Miyagi Prefecture. The city is the largest population center between Kuji and the Oshika Penninsula, the region closest to the earthquake’s epicenter. The first tsunami wave crashed ashore at the head of Kessenuma Bay 20 minutes after the seismic event. The sea rose to heights in excess of 60ft at the bay mouth, funneling a tremendous volume of water into the five mile long ria leading to the city (Kakinuma, Tsujimoto, Yasufa et al. 2012). As the tsunami passed through the Kesennuma narrows, flow-velocities exceeded 25mph – among the fastest ever clearly documented on film (Fritz et al., 2012). The initial sea-level rise created small waves which rolled up dry river canals within the city. The flood steadily increased in speed and intensity, eventually overwhelming flood barriers and pouring into residential neighborhoods. Hundreds of densely packed city blocks were ripped apart or swept completely away, choking the Okawa River with mounds of debris. Huge fires broke out across the masses of floating rubble, igniting the sky above the city as darkness fell over the region. 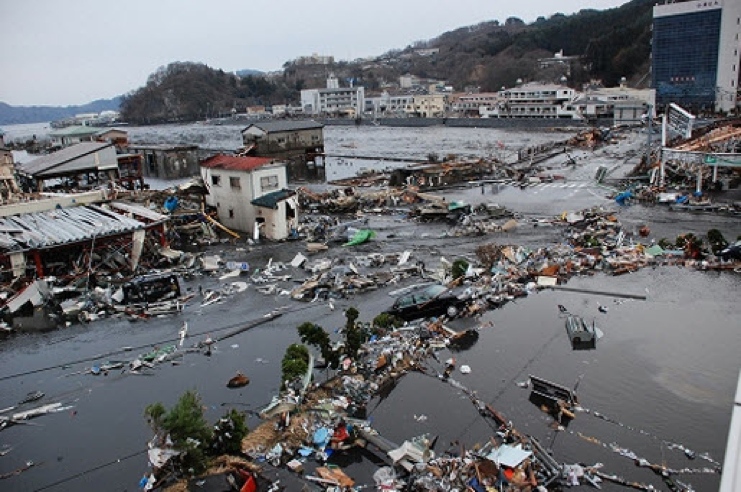 A total of 1,404 people were declared dead or missing a year after the tsunami (Mikami et al., 2012). A survey team found that the run-up heights at the end of Kesennuma Bay were slightly lower than those found in adjacent communities, but the damage was equally as catastrophic. An inundation height of 26ft was found in Kesennuma Port, whereas a height of 39ft was found a short distance away at the head of the Okawa River (Mikami et al., 2012). The tsunami was filmed at a fork in the Okawa River, nearly a mile inland from the harbor. Rough analysis of this footage indicates a water-level rise in excess of 20ft, evidence of far greater inundation heights along the coast. The flatlands of Kesennuma were inundated by flow-depths in excess of 18ft, causing the complete destruction of many wood-framed structures. A large area near the mouth of the Okawa River was swept almost completely clean of debris. Minamisanriku experienced some of the greatest run-up heights of any city affected by the tsunami. No footage exists from structures near the bayfront due to the complete destruction of the area. The footage above captured the tsunami obliterating buildings a mile from the shoreline. 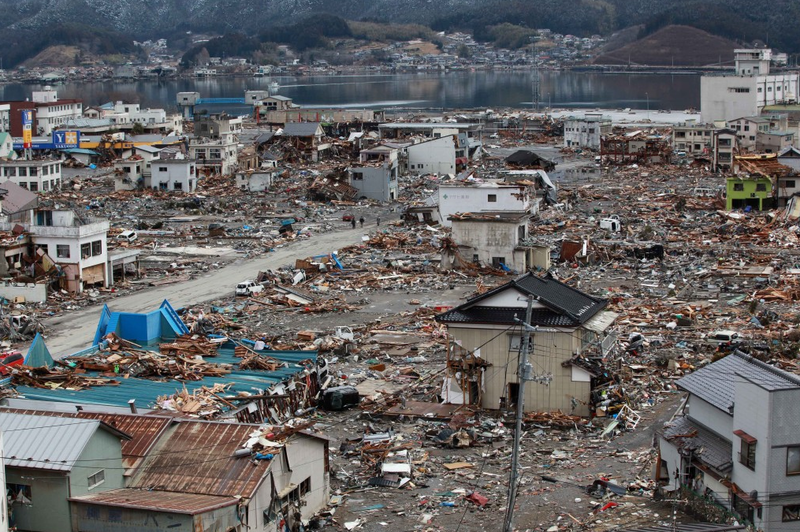 Some of the most extreme damage from the 2011 tsunami occurred in the small city of Minamisanriku. The city had perhaps the greatest tsunami defense system of any place in the world, with a 26ft sea-wall barricading the majority of the city from the Pacific. Annual tsunami drills had prepared Minamisanriku’s population, but the disaster plan was designed to protect the city from a tsunami less than half the height of the 2011 event. As in most areas affected by the greatest wave heights, the tsunami in Minamisanriku did not develop into a bore and instead travelled inland as a rapidly rising flood. Around 3:45pm, the water in the harbor slowly began to rise, flooding port-side buildings and ripping boats from their moorings. The city’s sea-walls initially held the turbulent ocean back from residential areas to the north. Within a few minutes, however, the ocean began to rise more quickly, and soon the freezing harbor waters over-topped the city’s defenses. Loud warnings broadcast from city hall echoed through the area as the tsunami ripped apart buildings nearest the seawall, temporarily clogging the streets with debris. As the water continued rising at greater than 10ft per minute, the debris dams gave way and a massive front of water bulldozed through the city. The speaker system fell silent as the tsunami swallowed the disaster management headquarters, killing dozens of town officials, including the 24-year old woman in charge of the disaster announcements. Reinforced steel gates more than 3ft thick were ripped from the coastal defense wall, allowing the tsunami to sweep inland unimpeded (“The Japan Tohoku…”, 2011). The average inundation height in Minamisanriku port was approximately 45ft, and a watermark 67.3ft above sea-level was measured just southwest of the city center (Suppasri, Koshimura, Imai, Mas et al., 2012). The final death toll was difficult to ascertain, but ranged between 904 and 1,1000 (Mikami et al., 2012). Several dozen residents survived atop the roof of a 50ft evacuation shelter on the shorefront, though the water completely submerged the building by 2ft. 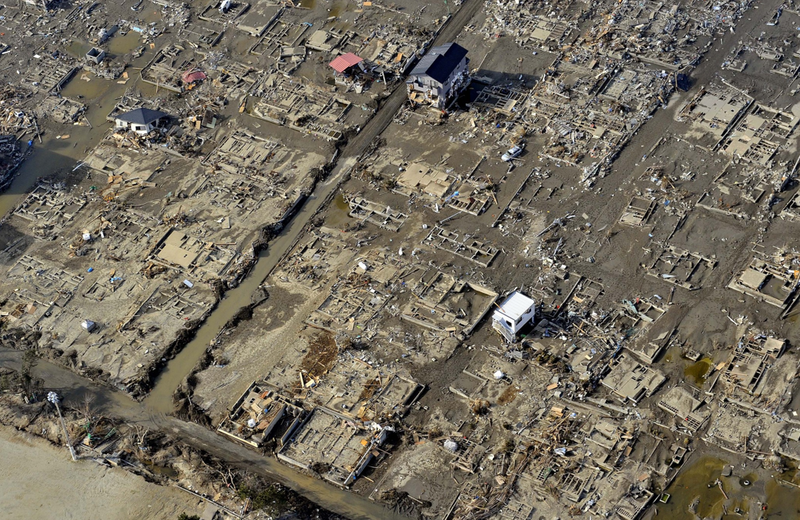 More than half of Minamisanriku’s buildings were swept completely away, erasing all traces of the city’s low-lying areas. At left, extreme building damage in Minamisanriku. The three story building reduced to a red skeleton at left center is the remains of the disaster management headquarters. At right, most of the area was swept bare, including half of the city’s tsunami shelters. A cameraman in Onagawa captured perhaps the largest tsunami wave ever filmed from within an inundation zone. Of all the large communities affected by the 2011 tsunami, Onagawa experienced the greatest wave heights. Located on the rugged Pacific side of the Oshika Peninsula, the city was among the first populated areas impacted by the initial tsunami wave. As with the majority of places affected by wave heights in excess of 50ft, the tsunami commenced as a gradual rise in the calm bay waters. Water flooded parking lots along the harbor front and funneled inland through city streets lined with multi-story apartment buildings. The water level rose unabated as second and third floor windows were punched out by the turbid tsunami surge. A cameraman captured apartment buildings breaking from their foundations and disintegrating as the flow-depths exceeded 45ft. A thick soup of mud and debris rolled up valleys far from the ocean, wiping out entire neighborhoods more than a half-mile from the shoreline. After the water levels reached a peak, a return flow clogged with fiery debris poured back into Onagawa Bay. Surveyors later discovered that the average inundation height in Onagawa was 59ft, with measurements ranging between 52ft and 67ft in the center of town (Yeh, Sato, Tajima, 2012). Within close proximity to Onagawa Bay, run-up heights up to 113.5ft were recorded (Suppasri et al., 2012). Reinforced concrete apartment buildings between two and four stories in height were ripped from the ground and rolled from their foundations in-tact. This marked the first time a survey team had ever documented the displacement of reinforced concrete buildings (Yeh et al., 2012). A 98ft long boat was found deposited at an elevation of 69ft, and a watermark of 137ft was found 1,000ft south-southwest of the Onagawa Sports Stadium (Lekkas et al., 2011). A total of 914 people were killed in Onagawa, a tremendous toll considering the city’s small population. View of the tsunami’s return flow pulling the remains of the city into Onagawa harbor. These extreme conditions would have been unsurvivable to those trapped in the surge. Onagawa was one of the most severely affected cities along the Tohoku coast. Just over 8% of the city’s population was killed, and it is likely that more than half of the city’s population would have lost their lives had no preparedness plans been in place. A videographer captured a city block being rapidly inundated by fast-moving water at Ishinomaki Gas, located a third of a mile inland from Ishinomaki Port. Of all the cities affected by the tsunami, Ishinomaki suffered the most fatalities despite being affected by significantly lower wave heights than areas to the north. Ishinomaki was the largest city to suffer catastrophic damage in the 2011 tsunami. Located on the northern fringe of the Sendai Plain, the city is primarily built upon flatlands less than 15ft above sea-level. Unlike areas farther north, the city was somewhat protected by the 10-mile long Oshika Peninsula, which lay between the harbor and the tsunami source. The primary wave wrapped around the peninsula and propagated northward like a giant tide, delaying the arrival time by 15 minutes. Video evidence indicates the rising surge was initially contained within the banks of rivers and canals. After a few minutes, however, the waters overtopped barriers and rapidly inundated large portions of the city. North-facing streets acted like canals, funneling the water inland through densely populated neighborhoods at high speeds. Flow-depths more than a mile inland reached 10ft, completely obliterating thousands of buildings. Additionally, suburbs just north of the city were swamped by a surge which progressed nearly 10 miles up the Kitakami River, which enters the ocean near Minamisanriku. An inundation height of 49ft was found in this area. One of the most controversial events during the tsunami disaster occurred at Okawa Elementary School on the outskirts of Ishinomaki, where the majority of the students and teachers were killed. According to media sources, an argument between staff members delayed the school’s evacuation by more than 30 minutes. In the end, the teachers reportedly chose to cross a nearby bridge and travel inland as opposed to seek shelter in a tall hill just steps behind the school. Most of the group perished when the tsunami traveled several miles up the Kitakami River and engulfed the bridge. A total of 3,890 people were killed in Ishinomaki and its suburbs, the greatest death toll of any city affected by the tsunami (“The Japan Tohoku…”, 2011). Due to the city’s size and low terrain, a large portion of the population was exposed to the tsunami – approximately 112,000 people lived in the inundation zone (“The Japan Tohoku…”, 2011). Coastal neighborhoods near central Ishinomaki were swept clean by surges of 25 to 30ft in height. News helicopters captured the tsunami inundating coastal flatlands in Sendai. Unlike Ishinomaki, downtown Sendai is located six miles inland and was not within the inundation zone. The city of Sendai is nestled between the Ou Mountains and a densely populated coastal plain that extends southward to Fukushima Prefecture. Past tsunami impacts were fairly moderate south of the Otsuchi Peninsula, so the area lacked the extensive defense walls found farther north. The 2011 tsunami developed into a series of bores more than two miles off the Sendai coast. A news helicopter streamed live footage of the tsunami soon after it breached shoreline forests in Natori. The incoming wave overwhelmed large agricultural canals and rapidly spilled across the flat landscape. Masses of dirt and debris turned the tsunami front into a massive wall of fast-moving sludge, increasing its destructive power. The Sendai Airport terminal, located a quarter mile from the coast and only 6ft above sea level, was inundated up to its second level. A survey team found that the inundation heights along the shoreline were generally between 20 and 30ft, although some areas had watermarks up to 40ft above sea-level. Flat topography allowed the tsunami to travel more than five miles inland in some areas (Buerk, 2011). The fatality rate and damage severity was most severe in Natori, where the Sendai Airport is located. In the Sendai city limits, a total of 730 deaths were documented, while another 980 people were killed in Natori (Mikami et al., 2012). Catastrophic damage in coastal Natori, where hundreds of fatalities occurred. While a few areas in Fukushima Prefecture recorded greater run-up heights, the tsunami’s greatest swath of destruction terminated just south of this area in Minamisoma.